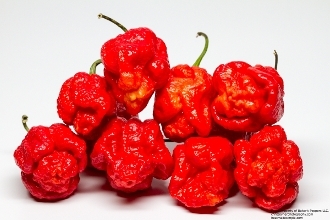 The Trinidad Scorpion Moruga is previously the OFFICIAL record holder for HEAT! Topping out at 2+MILLION SHU! They have a VERY strong citrus flavor, as do most "Capsicum Chinense" peppers. Please use caution when handling these! They make SUPERB hot sauce, as well as CHILI! They will mature from green to red. 155 Days to harvest! 20+ Seeds Per Pack...Order Yours TODAY! !